PRORECK PARTY 12 Portable 12-Inch 600 Watts 2-Way Powered PA Speaker System Combo Set with Bluetooth/USB/SD Card Reader/ FM Radio/Remote Control/Speaker Stand by PRORECK at IGWT. MPN: PARTY 12. Hurry! Limited time offer. Offer valid only while supplies last. Diversified music player The PARTY 12 features Bluetooth /USB/SD Card Reader/ FM Radio functions, allowing you to enjoy the versatility of this unit. The PARTY 12 features Bluetooth /USB/SD Card Reader/ FM Radio functions, allowing you to enjoy the versatility of this unit. By simply connecting your phone to the speaker via the Bluetooth, plugging in a SD Memory Card or a USB flash drive, you can enjoy your favorite audio files. The FM radio also allows you to listen to your favorite radio station. More attractive, the PARTY 12 has a LCD display clearly indicating the mode you choose with the remote control function allowing you to switch the mode when you are far away. You can connect to the passive speaker through speakon jack and mount the speaker to the 35-mm diameter speaker stand for a wonderful sound experience. 6 smooth rotary knobs enable you to easily control the MP3, Mic, Line as well as EQ levels (Bass/Treble). 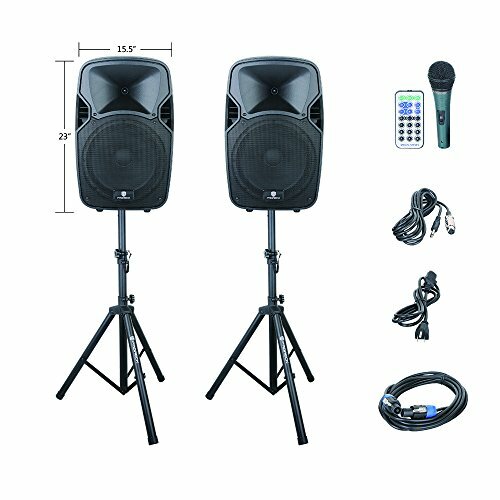 The PARTY 12 is equipped with XLR and 1/4'' Mic inputs, RCA Line input and RCA Line output. Speakon output is provided for connecting to the passive speaker via a 30ft length speakon cable. With two transport wheels at the bottom, you can easily move the speaker anywhere you want with only a little effort. If you have any questions about this product by PRORECK, contact us by completing and submitting the form below. If you are looking for a specif part number, please include it with your message.